In January, the release of the Census Bureau’s 2013 population estimates prompted the Crystal Ball to examine what the post-2020 projections for reapportionment might mean for the future shape of the U.S. House. While it’s fun to look at future projections, it’s also interesting to take a peek into the past to see how representation in Congress’ lower chamber has shifted over the years. Looking back since 1960, the first census to include Alaska and Hawaii as states, there have been very large shifts in the number of seats from the industrial Northeast and Midwest to parts of the South, Interior West and West. Map 1 below shows the changes from 1960 to 2010. On the “winning” side, so to speak, 14 states have seen a net increase in their representation in the House. The biggest gainers in this half-century period have been California, Florida and Texas, and no one else is really close. Both California and Florida have seen their seat totals increase by 15, while Texas saw an increase of 13 seats in this timespan. Arizona comes in next with an increase of six seats, followed by Georgia’s additional four. Three other states have seen their total increase by three seats, two have added two, and four have gained one. Meanwhile, 22 states have suffered a net decrease in their number of House seats. The biggest loser has been New York: It had 41 seats in 1960 but just 27 in 2010, a loss of 14 seats over the 50-year period. It’s remarkable to consider the fact that the Empire State’s representation has fallen so far from its peak total of 45 seats, which it had after both the 1930 and 1940 reapportionments. The state with the second largest decrease is Pennsylvania, which lost nine seats between 1960 and 2010. The Keystone State is joined in its contracting House delegation by other Rust Belt States Ohio (-8), Illinois (-6) and Michigan (-5), reminding us of a time when these states held much of the nation’s industrial might and therefore a larger proportion of the population. Three other states have lost three seats, five have lost two, and nine have lost one. Of the 14 states with no net change, most are very small — nine have either one or two seats in the House. All of these no-change states, save Tennessee, have had population growth constant enough to maintain the same number of seats throughout this 50-year period. Tennessee actually lost its ninth seat after 1970 but gained it back after 1980. Using the Census Bureau’s four major regional definitions, there has been a very neat and orderly change in reapportionment over the last 50 years. 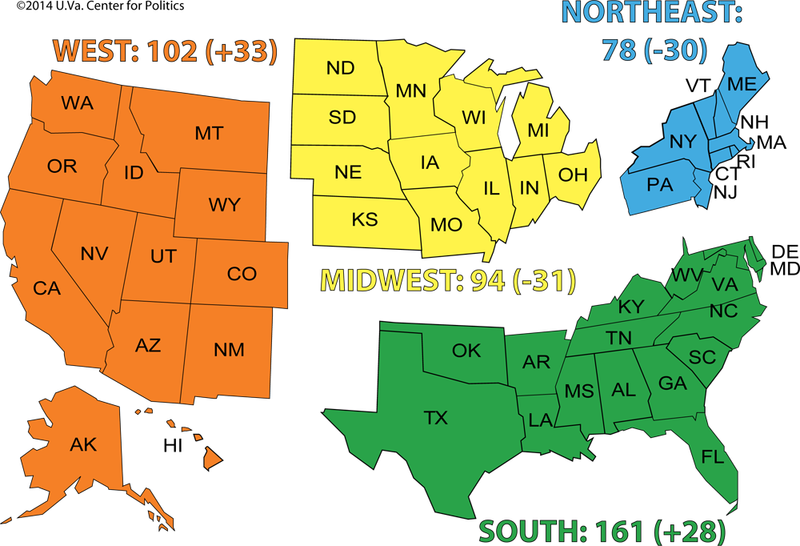 As shown in Map 2 below, the West has gained 33 seats and the South has gained 28, while the Northeast has lost 30 seats and the Midwest has lost 31. But within these regions are some particulars worth noting. 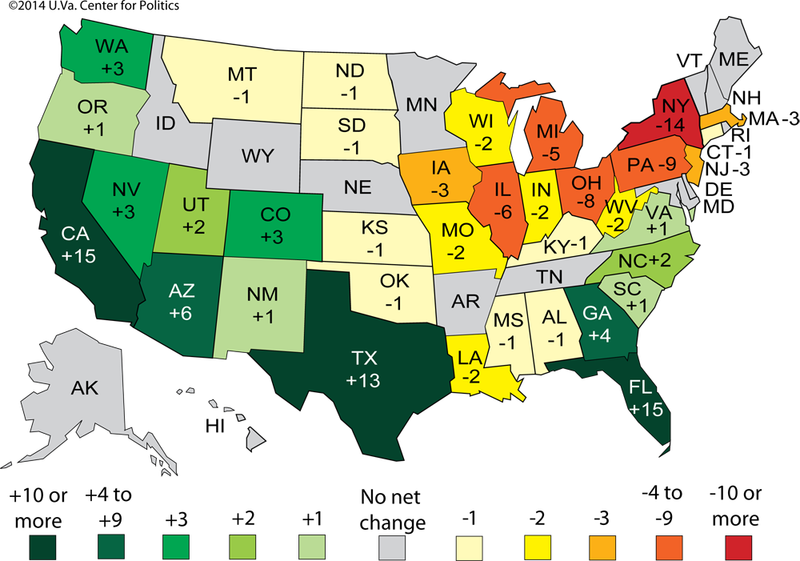 Although the states in the South have seen varied gains and losses, much of the West has only seen gains. This makes sense: Throughout the nation’s history, Americans have moved west, whether they were pioneers traveling on the Oregon Trail or Okies fleeing the Dust Bowl for California. In fact, the nation’s mean center of population shifted about 300 miles southwest from 1960 to 2010, reflecting the increased populations in the South and West but particularly the latter. Eight of 13 states in the West have gained seats in the last half century, while only one, Montana, has lost a seat in that time. The region’s mean seat change is about +2.5 seats and its median change has been +1. Turning to the regions that have suffered losses in representation, the nine states in the Northeast have averaged a seat change of -3.3 since 1960, the largest average decrease of any region. That is clearly a result of having the two biggest net losers, New York (-14) and Pennsylvania (-9). However, the median loss for the region is only -1, with four small states having seen no change since 1960. Still, no state in that region has seen a net gain in seats. Similarly, no state in the Midwest has gained seats in this timespan either. In fact, the loss in representation in the Midwest has been felt most broadly of any of the regions. Of its 12 states, 10 have suffered seat losses while the other two experienced no net change. The average change in the Midwest has been about -2.6 per state while the median decrease, reflecting the region’s broadly-felt losses, has been -2 seats. Because the size of the House is limited to 435 seats, each reapportionment results in some states gaining seats while others must correspondingly lose some. Thus, over the past 50 years, the West and South have gained a combined 61 seats while the Northeast and Midwest have lost an equal amount. The consequences of these changes have not only been felt in the House but also in the Electoral College, where reapportionment determines the relative weight of each state’s electoral say in determining the next president of the United States.